13 West Sussex small businesses received a grant to install energy efficiency measures at their premises. Combined, these measures reduced annual energy consumption by 139,314 kWh, carbon emissions by 72.2 tonnes and energy costs by £16,519. The grant funding was provided by West Sussex County Council and the scheme managed by the Sustainable Business Partnership CIC. The grants scheme looked to address lack of upfront capital as a barrier to small businesses installing energy efficiency measures. The reality of this barrier was evident in that 10 of the 13 businesses awarded funding applied to install a project that cost either below or very close to the maximum grant amount of £2,000, suggesting surplus cash was unavailable. £20,000 funding was awarded overall, with the total cost of projects installed £26,077. 12 of the 13 projects awarded funding, and 25 of the 32 applications received, were to install LED lighting. 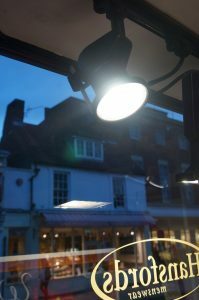 With recent reductions in cost, coupled with improved light output and quality, LED lamps offer attractive energy and carbon savings and typical returns on investment of between just 1 to 5 years. The project was run in partnership with RE:Start Local, an ERDF funded programme helping local SMEs in the environmental and low-carbon sectors develop their businesses. 11 of the 13 businesses awarded grant funding used local contractors to install their projects, providing a knock-on benefit to the local economy.